Tyson Chandler slammed home an alley-oop dunk off a Dragan Bender inbounds feed with four-tenths of a second left, and the Phoenix Suns held off the Memphis Grizzlies for the second time in six days with a 99-97 win on Tuesday night. Memphis tied the score at 97 when Jarell Martin slammed home a Tyreke Evans miss with six-tenths of a second left and the teams seems headed to overtime. With the subsequent inbounds play moved to midcourt, Bender threw the ball just over the far side of the rim, where Chandler was waiting to slam it down. Devin Booker had 32 points in his return to the lineup for the Suns, who beat the Grizzlies 97-95 on Dec. 21 when Evans missed a 3-pointer at the buzzer. TJ Warren finished with 17 points for Phoenix, which gave coach Jay Triano his 100th NBA win. Evans had 25 points and Marc Gasol scored 18 for Memphis, which lost for the 20th time in 24 games. J.J. Barea scored a team-high 20 points to lead Dallas past Toronto. Dirk Nowitzki (18 points), Harrison Barnes (16 points, 10 rebounds) and Maxi Kleber (15 points) also were the big producers for Dallas, which earned just their third win in 11 games. Kyle Lowry led the Raptors with 23 points, Jonas Valanciunas finished with 17 points and 11 rebounds, and Serge Ibaka had 11 points and 12 rebounds. Toronto lost for just the second time in 14 games. Kawhi Leonard scored a season-high 21 points while seeing the court for a season-most 26 minutes as Antonio defeated Brooklyn. LaMarcus Aldridge finished with 20 points and nine rebounds, and Pau Gasol nabbed his third double-double in a row with 15 points and a game-high 12 rebounds for the Spurs. Tony Parker scored 14 points, and Patty Mills and Ginobili tallied 11 each for San Antonio. Caris LeVert hit on 8 of 11 shots and led Brooklyn with 18 points. Allen Crabbe contributed 15, Rondae Hollis-Jefferson hit for 13 points and Spencer Dinwiddie and Jarrett Allen had 12 points apiece for the Nets. Tobias Harris scored 26 of his 30 points in the first half, and Detroit won for the fifth time in six games, thumping Indiana. Andre Drummond supplied 21 points and 18 rebounds for the Pistons, who never trailed. Ish Smith added 12 points, and Reggie Bullock chipped in 11. Pistons point guard Reggie Jackson sprained his right ankle during the third quarter. Jackson had eight points and a season-high 13 assists prior to the injury. Victor Oladipo, who came into the game averaging 25.3 points, scored a season-low 13 points for Indiana. Bojan Bogdanovic, Myles Turner and Domantas Sabonis added 10 points apiece for the Pacers. Nikola Mirotic scored 24 points off the bench, and Kris Dunn finished with 20 as Chicago snapped a two-game losing streak. Dunn bounced back from a 1-for-12 showing his last time out against the Boston Celtics. He hit 9 of 17 shots Tuesday and added 12 assists. The Bulls shot 43.7 percent from the floor and made 10 3-pointers. Milwaukee got 28 points from Giannis Antetokounmpo and 22 from Eric Bledsoe. The Bucks committed a season-high 20 turnovers that the Bulls turned into 24 points. Josh Richardson scored 14 of his 20 points in the fourth quarter to lead Miami past Orlando. 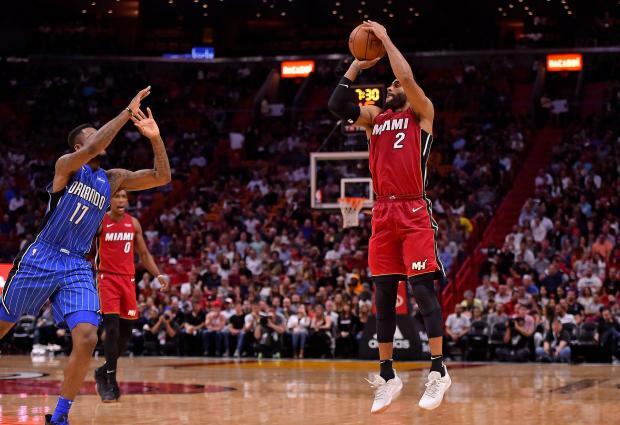 Wayne Ellington scored 18 points off the bench, including 12 in the fourth, for the Heat, who got starting center Hassan Whiteside back from a 13-game knee-injury absence. Whiteside produced seven points and eight rebounds in 18 minutes. Evan Fournier returned after missing eight games due to an injured right ankle and scored 14 points in 30 minutes for the Magic, who have lost nine games in a row. Orlando's Elfrid Payton had 19 points, eight rebounds and six assists. Jamal Murray scored 22 points and grabbed eight rebounds, Trey Lyles added 16 points and eight rebounds against his former team, and Denver beat Utah. Nikola Jokic had 13 points, seven rebounds and five assists before being ejected early in the fourth quarter, but the Nuggets closed it out to win their third straight. Derrick Favors led Utah with 20 points, Jonas Jerebko scored 13 and rookie Donovan Mitchell had 13 points and six assists. The Jazz lost for the ninth time in 11 games. Montrezl Harrell scored 22 points and Lou Williams added 21 as Los Angeles' bench helped power a victory over Sacramento. The Clippers' bench outscored the Kings' reserves 72-43. Los Angeles rookie Jamil Wilson started and scored a career-high 17 points, 14 of which came in the first quarter. DeAndre Jordan added 13 points and 15 rebounds as the Clippers won for the third time in their past four games. Willie Cauley-Stein had 17 points and seven rebounds for the Kings. Buddy Hield and Malachi Richardson each added 10 points for Sacramento.